Backed by experienced professionals, we are into the business of manufacturing, supplying and exporting a wide assortment of Disposable caps. These caps are manufactured using superior quality plastics and latest techniques. All our disposable caps provides high level of sanitation and protect the hairs from any kind of air borne infection. Our entire range of products are thoroughly scrutinized before the final delivery to ensure that only flawless material of the caps are delivered at clients' location. Further, these caps can be disposed and easily fitted in any type of virtual hair style. We manufacture surgeon / bouffant caps of superior quality, non-woven fabric with high class machine stitching. 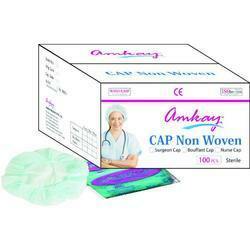 We are one of the accredited manufacturers, suppliers, and exporters of Surgeon Cap. These caps are manufactured using optimum quality fabrics and latest techniques. All our surgeon caps are designed in accordance with international quality standards and guidelines. 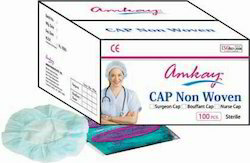 Our surgeon and bouffant caps are widely used in hospitals and veterinary areas. To meet the distinguish needs of our clients, we provide these caps in various sizes. Other information related to these surgeon caps are given below.